There were wins for Chichester and Pagham, a draw for Bognor but defeats for Middleton and Stirlands in the latest games in the top divisions of the Sussex Cricket League. Catch up with all the action, below, and get a league round-up on this website every Sunday. At 117-8 with a few overs left it looks like a low total was on the cards until Charlie Futcher (56) intervened. Sean Heather won the toss and decided to bat first. Runs came from Heather himself with 56, Jack Dawling 33, Mahesh Rawat 40 and a late flurry of 28 from Brandon Hanley off just 22 balls including three fours and two sixes. The Middleton innings closed at the end of the 58th over on 198-8. The pick of the Horsham bowlers was the Sussex spinner Will Beer who ended with figures of 4-63 from his 17 overs. In reply Horsham reached the target in the 48th over, finishing on 200-5. A partnership of 64 between Nick Oxley and George Garton steadying the innings from a position of 73-3 when Middleton, having removed Beer, felt they might just have had an opportunity. Oxley was 65 not out at the finish. 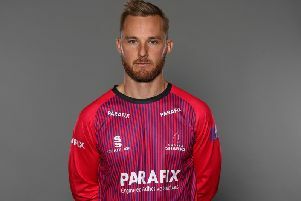 Middleton used five bowlers, all of whom took a wicket, including debutant Gregory Iago, who had the distinction of taking the wicket of Beer, a sharpe caught and bowled for just 14. Hot and sunny conditions greeted the players at Goodwood as Chichester attempted to build on the positives from their defeat the previous week. Opponents Billingshurst were near the top of the table at the start of play. Visiting captain Tom Haynes won the toss and made the slightly surprising decision to bowl first. Initially this decision appeared to be the right one as the hosts struggled to score runs on a tricky looking wicket. Billingshurst spinner Ben Williams (6-51) in particular proved difficult for Chichester’s batsmen as only Matt Bennison (33) found a way to survive for a significant period. At 117-8 with a few overs left it looks like a low total was on the cards until Charlie Futcher (56) intervened. Taking the attack to the hosts via three huge sixes, Futcher dragged the hosts to a respectable 165 all over from 52 overs with a 45-ball half century. The total looked gettable on paper but anything was possible on this wicket. Chichester needed early wickets and Dan Joseph and Matt Geffen obliged, removing the dangerous Haynes (0) and Australian Jake Cross (2) very cheaply. Tim Weston (49) kept the visitors in the chase before he was clean bowled by Joseph (4-50). Wickets fell regularly for Bilingshurst but Andy Barr (40) remained at the crease and offered some hope to the visitors. When he was run out Billinghurst were down to their final pair with 27 needed off four overs. To the visitors’ credit they resisted the urge to bat out for a draw as last man Jamie Piper (16) struck a few boundaries to take the game down to the final over. With ten needed to win, Piper went for one big shot too many and was bowled by Joe De La Fuente (4-42) to give Chichester victory by nine runs. The tense victory earned the maximum 30 points for Chichester and moves them up to fifth. They visit St James’s Montefiore on Saturday. On a fine day at the Regis Oval, Mikey Harris’ men won the toss and elected to bat, but at 58-5 this wasn’t looking a good decision. This didn’t deter skipper Harris, who made a combative 61 and acquired support from Tom Woolnough with 30, his brother Jamie Woolnough with a crisp 21 and the usual big hitting from Marquino Mindley with a brisk 29 to see Bognor end on 181 all out. For Lindfield Shohel Ahmed with 4-60 and Phil Weir with 4-31 were the pick of the attack. In response Lindfield were in the hunt at 111-3 but with Mindley bristling with pace and aggression grabbing 3-44 and the more subtle but equally determined Scott Bingham continuing his recent rich vein of form with 3-48, the brakes were applied and Lindfield ended on 161-8, a draw the outcome. Pagham batted first and were soon 26-2 but a partnership of 99 between Jack Stannard (65) and Ryan Barratt (54) saw the away side get control. Although Pagham lost wickets regularly, useful knocks of 29 from Stuart Hanks and 21 not out from Richard Bird got Pagham to 229-9 after 53 overs. Ed Lamb (3-28) and Chris Etherington (3-53) were the pick of the Steyning bowlers. The Steyning batsmen in reply could not come to terms with the pace of Rico Webb (6-87) and the guile of Justin Scott (2-34). When Sean Rutter removed David Kennett for 38 Steyning were 122-9 and Pagham looked to be heading for an easy win. But Chris Etherington batted solidly for 29 and supported by Andy Isaacs 19 not out saw the home side come with five overs of getting an unlikely draw. But Pete Cotterill bowled Etherington with a superb delivery and Pagham earned their third win in a row. On another glorious day in Birdham, Stirlands could not continue their unbeaten run. Visiting captain Tim Jarvis won the toss and decided to bat on what appeared to be a traditional Church Lane batting track. Openers Jarvis and Hugo Gillespie started strongly, punishing anything loose from Jamaine Bullen and David Briance with added assistance from a quick outfield. Despite the strong start by the visitors, Bullen was able to induce a mistake; Jarvis driving at a wide delivery straight into the rateful hands of Torquil Deacon at slip for 19. A second wicket fell soon after, Bullen clattering a delivery into Jack Elliott-Monday’s stumps, leaving West Chiltington 54-2. The young pairing of Gillespie and Reuben Taylor batted with great maturity, taking their side to 100 when Taylor was caught trying to loft debutant left-arm spinner Nat Clowes, only to mis-cue his shot and be safely caught by Will Gubbins for 40. Gillespie was next to depart, the first of three quick wickets for the home side, falling to Dan Mugford for a patient 66. The visiting batsmen all showed great application in the face of tight bowling; guiding their side beyond 200 as the oppressive heat began to take its toil on the fielding side before declaring on 222-9 off 50 overs. Stirlands began their reply in the worst way, Will Gubbins being run out for nought after some questionable calling by his opening partner. This early wicket galvanised West Chilt as they bowled tightly and fielded with great energy; being rewarded with regular wickets as they reduced Stirlands to 42-5. Under-19 Jake Moores showed maturity beyond his years, waiting for any loose delivery, initially putting on 28 with Mugford, 30 with Richard Gubbins and 25 with Adam Norris to earn his side batting points before finally falling for 52 as the last man, with West Chiltington taking the spoils after outplaying their hosts. Stirlands knew they’d been outplayed but were able to take some positives from the defeat; Under-15 player Nat Clowes bowled with great accuracy on debut taking 3-51 in 14 overs, earning praise from his team-mates having taken full advantage of the opportunity offered to him. This week, Stirlands look to bounce back with the short trip to Pagham.